The adenium obesum, commonly known as the desert rose, is a succulent plant. It is native to hot humid climates for Africa and Arabia, but can be grown anywhere if cared for properly with warmth and sunlight. With the swollen stems and beautiful pink and white flowers clustered tightly with narrow green leaves, these plants are very distinguishable. This article explains all you need to know about how to grow desert rose as well as tips for caring desert rose. The desert rose needs plenty of water, but cannot survive in standing water. Make sure that the pot you choose has superb drainage to prevent standing water. Terra cotta or ceramic pots are best. You also want to ensure that it has full sunlight daily and has soil that allows proper drainage for its best growth. Using a mixture of two parts loam and one part course sand will allow proper drainage. Making sure the desert rose is planted in a container that can be easily moved when the weather demands and has great drainage will allow you to have a succulent plant year round. Sunlight: The desert rose is perfect for a sunny window because it needs full sunlight daily. To help the plant grow a straight, strong, stem it is important that your rotate the pot every two to three days especially in young plants. Temperature: The plant's natural habitat is in the rainforests of Africa and Arabia so it is important that the temperature is kept at a minimum of 50ºF at all times. At 60ºF or higher it may retain its leaves all winter. Soil: The soil needs to allow for optimal drainage and an ideal pH of 6.0 (slightly acidic). Humidity: Modern heating systems will cause the water to evaporate more quickly. During the winter months placing your pot into a shallow tray of pebbles with water added is a great way to help the plant retain moisture. Test the moisture of the soil by inserting your finger into the soil, if it feels dry it is time to water your desert rose. Use a drip pan when you water your plant. Water the plant until the water begins to drip into the drip pan. Empty the drip pan after each watering, you may have to check back after a few minutes to see if it needs to be emptied again. You always want to water your adeniums thoroughly each time; 2-3 times a week during spring and summer, and 1 time a week during fall and winter. Do not be afraid to leave the plant while you go on vacation, it can live several weeks without water. You do want to watch for excess water though, as the desert rose is extremely susceptible to root rot. If you use a proper soil and pot, you will not have a problem. Spring, Summer & Fall: As long as the nightly temperatures do not drop below 40ºF, the bonsai can be left out on the patio or in the garden. Winter: During the winter when the temperatures begin to near 40ºF, it is time to bring the bonsai inside. Place the plant in a window that is facing the south so that it can receive as much sunlight as possible. It is normal for the Desert Rose to lose some of its foliage, if not all during the winter months. Always use the products label recommendation for pot size to ensure you use the proper amounts of fertilizer. In the spring you want to use a soluble fertilizer every two weeks. In early summer, when the plants' growth rate slows, stop using the soluble fertilizer and make one application of a slow-release palm specialize fertilizer. In early fall, about two months later, apply the slow-release palm specialized fertilizer one more time. This desert rose care tip in essential to promote growing. Trimming and pruning your desert rose in the spring will help it grow more branches and more foliage for a fuller more lush plant. When trimming and pruning you want to cut back the new growth as far as you can without cutting off too much. The plant needs some new growth to help it remain healthy. How much you trim back depends on how small you want your desert rose to remain. Mid spring is the best time to repot your desert rose. You want to wait for warmer weather as not to damage your plant. You also want to wait for some of the new growth to develop so that you can do some trimming and pruning before you repot. Stop water your plant so that the soil can dry out, you want the soil to be dry before you repot. Make sure you knock the dirt of the roots and remove any dead or rotted roots and treat any cuts it may have with a fungicide. When you put the plant into its new pot, fill with dirt as you go along so that you can spread the roots and give them room to grow. After you have repotted the plant, wait a week or two before you give it water. Slowly build back up to its large amounts of water to prevent root rot. Make sure your seed is fresh and place it in a container filled with a well-draining growing medium such as perlite or a sand and soil mix and just cover. While keeping your seed between 80ºF and 85ºF you need to water them from below daily and from above once every three days. Once the seedling appears only water it from below until it is large enough to transplant. You will see the seedling bloom in the same year. After you have let the cutting from the tip of a branch dry out for a day or two, water the end of the cutting. Then dip the end into a rooting hormone and plant it in a well-draining growing medium. Water and spray with a mist daily making sure it is draining well. In about 2-6 weeks it will take root. When it is big enough, transplant into a more permanent container. 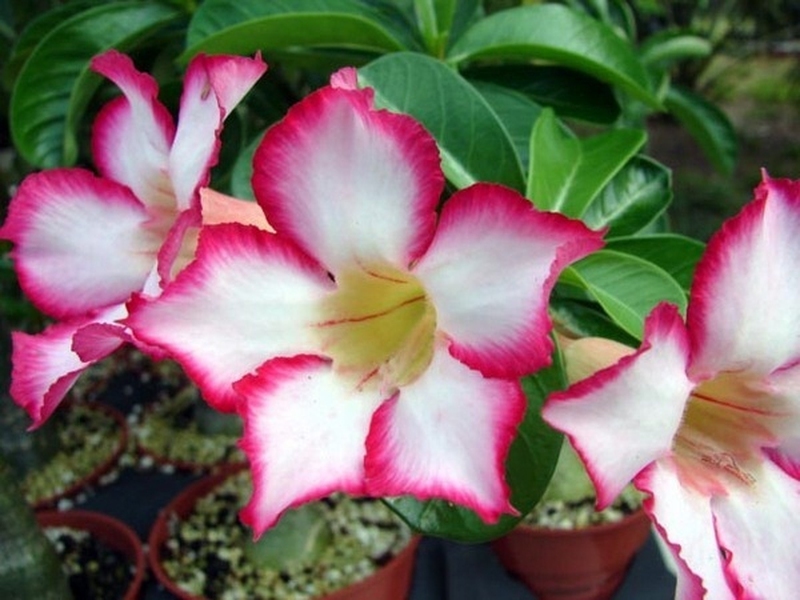 Root Rot: Root rot can kill the desert rose if not treated quickly and properly. Although the stem may feel slightly soft when it needs water, root rot will gradually spread through the entire plant. If the area is soft and fleshy in small areas you need to use a sterilized knife to cut out the rot. You can use household disinfectant and the wound will heal after a few weeks of proper care and watering. Pesky Pests: Spider mites, scale and meal bogs commonly plague the desert rose. Use an insecticidal soap (oil-based insecticides will damage the foliage) to saturate the plants foliage, then repeat one week later. If the bugs are still present use the insecticidal soap on a cloudy, cooler day. Do not let the beauty of these plants fool you, if you come into contact with their sap it is important that you wash yourself off right away as the sap is poisonous.